Come October and November, hip-hop will take center-stage. This medium of expression of the youth now gets a national stage and sweepstakes, with Breezer Vivid Shuffle: India's largest hip-hop dance festival. This is a pan-India competition with 5 regional rounds and one grand finale where individuals and crews will get the chance to battle it out across a variety of styles. Apart from being the first-ever event of this scale, Breezer Vivid Shuffle also offers India's largest cash prize pool for a hip-hop dance festival. Excited enough? AGE RESTRICTION: You must be 18 years or above on the day of the event to participate. - The event consists of a Regional Round and a Finale. - Round 1: Cypher for 50 seconds. - Round 2: Top 16 battle it out 1v1 to discern who qualifies to the Finale. 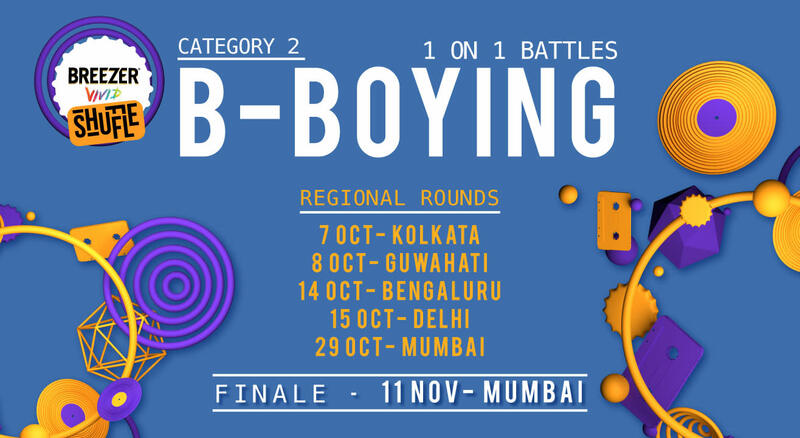 - The qualified BBoy/Bgirls in the country battle it out 1v1 till we find the best BBoy/BGirl in India.